FilSurfBlogContestsFilSurf & Cahlo Design Contest! FilSurf & Cahlo Design Contest! 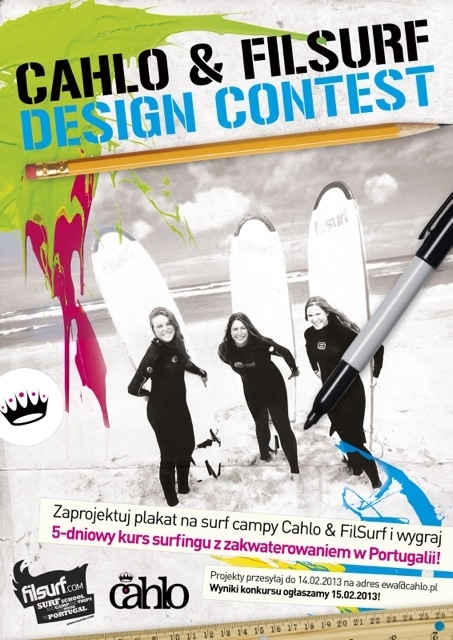 Together with Cahlo Rebel Ladies Crew, our partner we are announcing the DESIGN CONTEST for the BEST SURF CAMP POSTER!!! The winner gets a 5-day-surf course incl. accommodation organized by FilSurf in Praia da Luz|Portugal in one of the below dates! logos (FilSurf, Cahlo, Rip Curl wetsuits). 2. Send your project in jpg., png. or pdf. file to: ewa@cahlo.pl by 14th Feb 2013. 3. On 15th Feb 2013 check on our FB profile http://www.facebook.com/FilSurf if you are a lucky winner!!! You must be at least 18 years of age to enter the competition. FilSurf among very few surf schools listed on Turismo de Portugal website! Our surf camps in 2014!